I have three kids at home (ages 10, 7, and 5), and while I have big goals for my blog, I also want to spend as much time as possible with my kids while they're little. What I've found is that if I work on the RIGHT things at the RIGHT time, I can still grow my blog income without sacrificing time with my family. I want the same for you!! Getting my blog to six figures wasn't a matter of luck. It was intentional creation of content that resonates AND small tweaks after the fact that set my blog up for more sales, more subscribers, and more impact overall. What you create is just half the battle. What you do after the fact matters just as much, if not more! 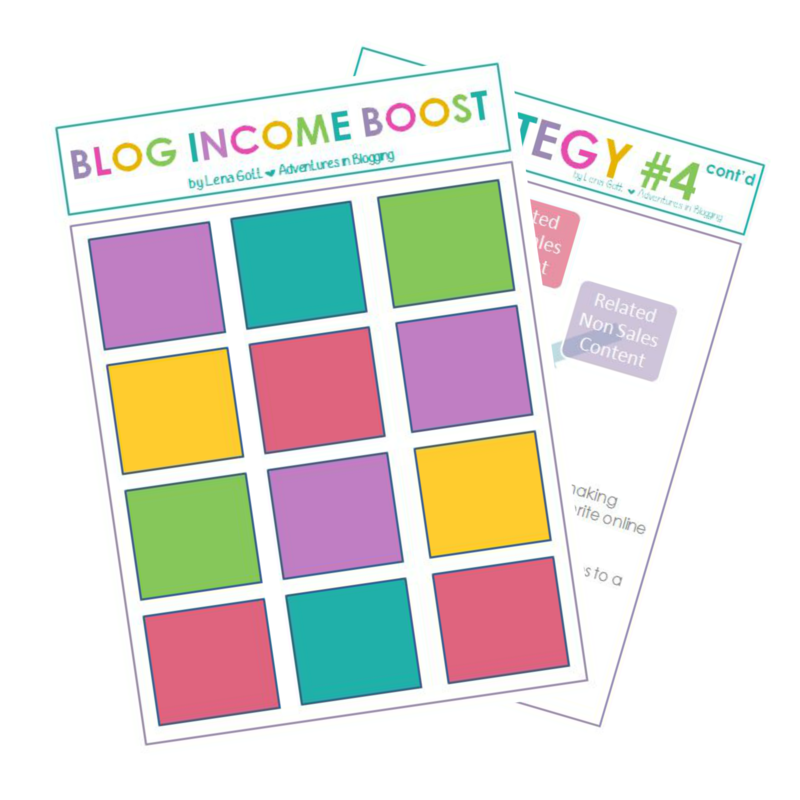 You need both pieces of the puzzle to boost your blog income to a comfortable level. I feel like I did everything the HARD WAY because there was no "blogging manual" to follow. I don't want you to flounder around like I did for years before I figured this all out. 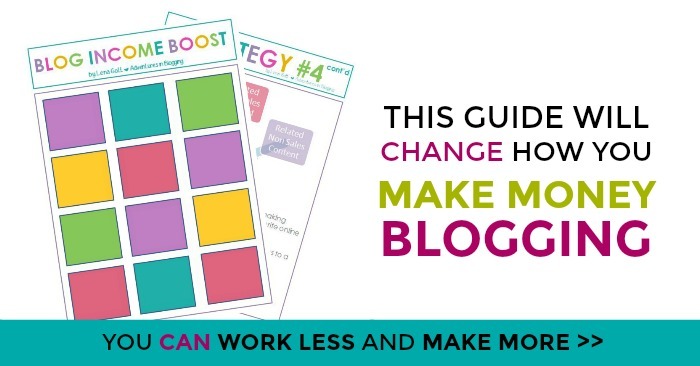 This guide is your owner's manual to a blog that has an impact and makes a good income! 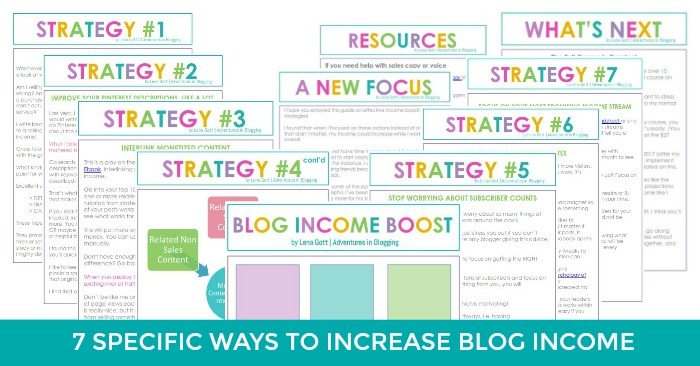 Blog Income boost has 7 actionable strategies that you can implement today to move your blog forward. It not only tells you what to do, it gives you permission to STOP doing the things that don't matter. It even gives you examples of things that I dropped in order to focus on what matters. How relieved will you feel knowing that you are on the right track? I was tired after working hard all year on building traffic. By the time 2016 rolled around, I was ready for a change. In early 2016, I intentionally stepped off the blog traffic train to focus on making more conversions on the traffic I was already receiving. I was working an average of 30-35 hours per week in January 2016, and the thought of continuing that path did NOT appeal to me. I wanted more time with my family! So off I went on a path to figure out ways to earn the same or more from my blog without working as hard. I used all the principles of growing a business like a CPA (my former job) to grow my blog. And this is what happened! Even though my page views stagnated, my income rose! Furthermore, I was able to decrease my work hours to 20-25 hours per week because I figured out how to outsource profitable work to a VA.
2016 was my year of working smarter all the way around. It's me starting to put to paper ALL the strategies I used to increase my income in 2016 (and continued into 2017) despite working less + getting fewer blog visitors. It's the beginning of a master class on income strategies that just WORK. The full course won't be available for a very long time, but I didn't want to wait until I had time to create the full blown course to give you these strategies to use in the meantime. If you don't know exactly what you should be working on next for the biggest return on your time investment, this guide will give you some action items! Blog Income Boost is a QUICK read. It's not long on purpose. It's short because what will actually make you the most income on your blog is NOT complicated. This guide cuts to the chase! It gives you the scoop on the little tweaks to your blog and presentation of your content that make ALL THE DIFFERENCE to your bottom line. How would you feel if, not too long from now, you no longer felt like you were grasping at straws to create content that earns?